Once again, it’s the Genoese comic, Maurizio Crozza who has taken the best measure of “Italy’s mayor”, the former mayor Florence, Matteo Renzi. He has been imitating the ambitious young local administrator for almost two years now and identified his key features as his youth and lack of clear programme. Renzi follows the Florentine stereotype as a honey-tongued talker always with the sharp and witty reply ready but usually signifying nothing. He’s often compared to an Italian Tony Blair (43 when he became prime minister, and above all someone who made the Labour Party into a winner). Renzi was born in 1975, and joined the left wing of the Christian Democratic party (the Italian Popular Party - PPI) in 1996 which then morphed and made up part of today’s Democratic Party (PD). He was elected president of the province of Florence in 2004 and served his five year term standing for mayor of the city in 2009 and winning. In late 2012, he made his bid for a national position when he stood unsuccessfully for the leadership of the Democratic Party against Pierluigi Bersani (presumed to be the safe and reliable, and above all left wing candidate). A year later, after Bersani’s failure to secure a working majority in the February 2013 elections, he stood again and won in December 2013 with PD members prepared to vote any candidate that they thought could win. It was clear from the beginning that Renzi had his sights on the prime minister’s job but for two months made reassuring noises which convinced no one. The most famous one was his January tweet “Enrico [Letta] stai sereno” which has become a byword for a stab in the back, creating anxiety and not being serene. He struck in mid-February and by 21st. was prime minister in an operation which the Gianfranco Pasquino described as being carried out with “coldness and nastiness” . He had had the nod from President Napolitano who didn’t want to split the PD with a no-confidence debate and vote. At 39 years and 6 weeks (6 weeks younger than Mussolini), he is the youngest Italian prime minister ever, and like Mussolini did not lead his party to a victory in the popular vote but then neither did his two predecessors, Enrico Letta and Mario Monti. Once nominated, he raised eyebrows with his relaxed attitude, addressing the Chamber with a hand in his pocket. More important was the list of proposed reforms, a new electoral law by the end of February (along with constitutional reform and the abolition of the Senate; a tall order), employment in March, civil service in April, fiscal system in May, then justice. These are all old favorites; the only innovation seems to be to call the employment reform “Jobs Act” in English (sometimes singular, “Job Act”) as if proposing a labour market reform and employment encouragement measures in English rather than a banal Italian politica dell’occupazione made a big difference. Three weeks into the government, the Renzi tornado has yet to show any concrete effects, hardly surprisingly. The electoral law reform is already bogged down and the promises of having it passed in the Chamber by the end of the week, are just that, promises. The other promises are vague, and expensive with no indication of how the programme will find its financial cover . The language was certainly new and different, one commentator called it “north American”. The government itelf is a paradoxical mixture; the cabinet at 16 members, half women and the youngest ever, is unique in age, size and gender. In contrast, the 45 junior ministers are an object-lesson in old-fashioned spoils-sharing, a classic example of the so-called Cencelli manual which divided the ministerial posts according to a combination of prestige and vote-gathering capacity. The flaws and fragility of the new goverment were shown last week when one of the undersecretaries, Antonio Gentile of Cosenza was shown to have pressured a local paper into not publishing the news of his son’s indictment on serious charges. There is a recording of a conversation between the paper’s printer and the journalist who wrote the piece; not a word is actionable but the whole 15 minutes is a not very veiled threat and an object lesson in how and why it is not necessary to say “I’ll smash your face in if you don’t comply”. Only this time, the threats bounced back and now the whole country knows about Gentile junior’s indictment instead of just the readers of a small local, paper newspaper and Gentile senior was indeed forced to resign. We don’t know what the pay-off was, if there was one but to lose a minister after less than a fortnight is more than careless on Renzi’s part. On the positive side, Renzi took the PD into the European Socialist Party, firmly anchoring it in the European socialdemocratic family another reflection of Blair’s shift of Labour from left to centre left. But Renzi’s biggest problems are the usual demon trio which creates obstacles for reforms anywhere: cabinet and parliament management and mediation (the easiest to overcome as we have seen) but even so, the Gentile episode has already shown the difficulty and this week’s electoral reform bill has already shown Renzi’s limits. He has shown that he can juggle variable majorities for different measures, dealing with Berlusconi’s opposition Forza Italia at the same time as his coalition ally and Berlusconi’s former deputy, Angelino Alfano’s Nuovo Centrodestra. Secondly mediating with other European leaders. None is prejudicially against him and all want to see Italy succeed but he has little experience. It is significant that Letta visited Merkel, Barroso and Draghi in his first three days as prime minister, Renzi so far has only seen European Socialist leaders. Thirdly, the biggest obstacle and not just for Italian leaders, is the implementation of reforms by the ministerial bureaucracy after a law has been passed in Parliament. Renzi has said that he wants his government to last till its natural term in 2018 but neither he nor anyone else are holding their breath. The Falklands are still the Falklands in the Vatican even with an Argentinian Pope. In the third loggia above the Belvedere Courtyard are some of the offices of the Secretary of State, in practice, the government of the Vatican. A portion of these are the Dicastery of Relations with States, in practice, the Ministry for Foreign Affairs where I went with students last week. And as one might expect in the Vatican, the loggia is decorated with 16th and 17th century panels of maps of the papal possessions in Italy and more generic maps of the rest of the world. 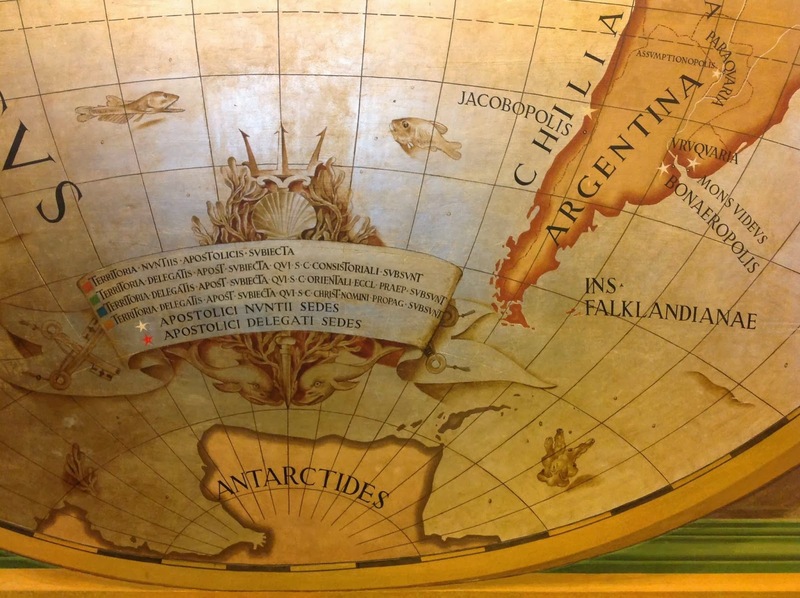 Off the main gallery, there is a modern map of the world showing where the Holy See has its delegates and nunzios; it follows 20th century cartography but with somewhat improbably invented Graeco-Latin names. The capital of Chile (itself renamed Chillia) loses its sainthood and becomes the not entirely euphonious Jacobopolis (tho’ I doubt that many people actually pronounce the word out loud). On the other side of the continent, there is the Argentinian capital, Bonaeropolis, only slightly less contrived. But the real surprise in what must be the oldest diplomatic organisation on earth, is the unequivocal commitment to British sovereignty over those islands in the South Atlantic “Insulae Falklandianae”. (top left, thanks to Peter Cardena for the photo). Long before the 1982 Falklands War, I met a Czechoslovak girl in Buenos Aires who explained with sardonic confusion her problems in high school. In her French classes, she told me, they stated punctilliously that “Les Îles Malouines étaient decouvertes par des pecheurs de St. Malo et alors, elles sont françaises”. Then the English teacher arrived and told the class, no less uncertainly, that “the Falklands are British and ever more shall be so”. Finally in history, “las Islas Malvinas son argentinas y nada puede cambiarlo”. “What am I supposed to accept?” She came from a country hardly 50 years old at the time and which was to have only another 20 to run (and when they did break up in their Velvet Divorce, it was with no fuss and no violence) so one could understand her confusion. Territorial nationalism does not run very deep in either the Czech Republic or Slovakia. It is good to see that it does not run deep in the Vatican even with a Supreme Pontiff who hails from the country with the loudest claims to the islands. The first time I saw the map, some six or seven years ago, I asked if it represented a political rather than a cartographical one and received a mumbled and uncertain response (often I’ve seen airline maps where the islands are ignored or conveniently covered with other script – the Vatican could have finessed the matter similarly). Obviously the Falkland-Malvinas question is not a priority for the Pope or even for his diplomats but it is a healthy sign that they are so laid back about it. Their predecessors divided the Americas and the rest of the world between Spain and Portugal in 1495 with the Treaty of Tordesillas so they have some experience in that part of the world and even for the Holy See, priorities change in half a millenium (or even half a century). Appellantur vulgo Malouines eo quod nautae Galli ex urbe Saint-Malo eas lustrare consueverant. Nomen Malo Latine sic redditur: Maclovius, ii; re quidem vera urbs illa ex usu Curiae Romanae (urbs) Sancti Maclovii nuncupatur; incolae vero Gallice audiunt: Malouins (m.) et Malouines (f.); merito ergo eae Insulae Latine Maclovienses dicuntur. That's as maybe but if you start by calling the Falklands then the rendering into Latin is plausibly “Falklandianae” as the Vatican cartographers give it to us. Much more serious things are happening in the Vatican and I will try and address some of the issues in my next blog. Labels: The Falklands are still the Falklands in the Vatican even with an Argentinian Pope. Mussolini on the road to Sainthood. Rome provides unlikely images and stories which have delighted travellers and resident observers for centuries. In his “Roma” (1972), Fellini was more the poet than the documentarist but he surely would delight in the juxtaposition of tourist tat on sale near the Vatican today; of another famous son of Fellini's Romagna with rather more sacred images. After a visit with students to the Vatican’s foreign ministry this week, I was having a coffee with them in a bar back in Italy, together with an historian colleague who works on the Vatican and fascism. 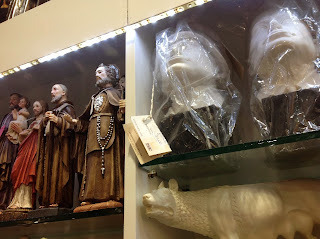 Next to us was a shelf full of statues of everyone of note from Romulus and Remus to the present Pope. Casting my eye over this sub-Berninian panoply, I noticed a very prominent jaw, sheathed in cellophane but still very recognisable. I turned to John and asked him “Is that who I think it is?” He nodded gravely. It was a Wednesday morning, just after the Papal Audience so the place was choc-a-bloc and hardly suitable for a long chat with the owner, but one day soon, when they have a moment, I will go back there and ask how many they sell and to whom. For the last 20 years or so, fascist memorabilia has been increasingly available on the open market without need to go into back alleys and sneak away with a plain brown paper bag. On Christmas stalls there are coffee cups with Mussolini in various poses and newsagents sell Mussolini calendars. That is shocking enough and so are all signs of a rehabilitation of both Mussolini and fascism but I was extremely surprised to see him scowling out sternly from between ancient Roman and Catholic icons. Obviously we ought to be more concerned with the modern fascists in various guises who are active in politics today across the whole of the EU but without a clear and unequivocal message that the original version and its leader are unacceptable in Italy and Europe it is very difficult to condemn the ideas of Mussolini’s heirs. There must be many tourists who make a silent equation of the moral value of people depicted in plaster on those shelves… a chilling thought. Labels: Mussolini on the road to Sainthood. While government and parliament deliberate over the budget where the final vote in the Senate is due this week, the foreign media (and the Italians for that matter) are more interested in guess-who. And he is doing his best to concentrate political and media attention on himself and his imminent expulsion from the Senate. On Saturday he gave an impassioned version of his stock speech to the young members of his new Forza Italia. According to this narrative, he is the victim of a left-wing judicial conspiracy; he railed against the judiciary and the Left which has never been able to defeat him politically. If, as is almost certain. he is expelled, according to Berlusconi, it would be a coup d’état and the end of Italian democracy. It would not only be an affront and humiliation to him if he had to do social services “cleaning loos”, as he said, is obviously a serious fear for him. “Rehabilitation” would no doubt really be humiliating for him, but he maintains it would humiliate the whole country. He told his audience that he had brought the US and Russia closer together and various other statesmanlike deeds. Hyperbole apart, he sounds much like Josefa Idem, the minister for equal opportunities who was forced to resign in May because she had fiddled the tax use of her gym “After all the Olympic medals I have won for Italy, I should not have to go”. Even if Berlusconi’s claims about his world statesman role were true (which they’re not), it is hardly the point. On 1st August, he was convicted of tax evasion and tax fraud after three levels of judgement in trials that lasted a decade; he had the choice of the best lawyers in the country and for most of the time, two of them were members of parliament working on lawmaking committees which could and sometimes did change laws in their client’s favour. He used his position either as prime minister or as member of parliament to delay hearings in the hope that the statute of limitations would have the case dismissed. After the guilty verdict, he has hinted at, asked for and demanded that President Napolitano give him a pardon, the last time on Saturday when he said explicitly that he was not going to ask for it (which would imply the acceptance of guilt) but that Napolitano should give it to him against all the rules and the precedents. Napolitano has responded (the first time on 13 Aug., the last on Sunday) patiently explaining that he cannot do so legally. There are many valid criticism of Italian justice and judges do make mistakes, sometimes terrible ones, but no one can accuse the judiciary of running kangaroo courts. The other element of Berlusconi’s narrative that no one challenges him on (most recently on RAI 1’s “Prima di tutto” this morning) is that because “the Left” (never the “centre-left”) cannot defeat him politically, they have taken the “red judges” as allies to kill him legally. Berlusconi was defeated at the polls in 1996 and again in 2006 by Romano Prodi; he was removed from office by his ally Umberto Bossi’s defection in 1994 and again in 2011 by the gradual disintegration of support for his coalition caused by his inability to face the euro crisis. This year his party did very well compared to the opinion polls a month or two before the elections but it polled 7.3m compared to 13.6m in 2008, a real collapse. On Wednesday 27th the Senate will debate and vote on Berlusconi’s expulsion from the Senate. It will be an open vote as the regulation was changed. Normally personal matters involving a single senator are secret votes allowing single representatives to avoid the party whip or public opinion but the PD and some of the opposition decided that this vote was not a personal one involving Senator Berlusconi but was a question of testing a new law, the so-called Severino after the then minister of justice. This is an anti-corruption measure passed in December last year which prohibits anyone with a conviction of more than two years from holding elected office or standing for office. It has been applied to city and regional councillors and to candidates in the general election in February but never to parliamentarians up to now. Berlusconi has threatened a big demonstration on Wednesday bringing a warning from Napolitano that it should be legal. Certainly there will be a big crowd outside the Senate on Wednesday bringing on fears of the apocalyptic images in the finale of Nanni Moretti’s 2006 film “The Caiman”. A canny move would have been for him to resign before the vote; the Senate would have to deliberate (and vote) to accept the resignation and that would take a few weeks. Above all, it would be a secret vote. But on Saturday he said very explicitly that he was not going to resign. Instead he has announced new evidence to which would prove that he was not guilty in the Mediaset fraud case (and therefore the Senate should not vote on Wednesday). The other parties have said that the vote will go ahead. The office dealing with the prying and spying on Chancellor Angela Merkel apparently goes under the coy euphemism of Special Collection Service. A long time ago, a colleague on the University of Maryland’s programme for the US military told me of another spooks’ euphemism used back then (and now for all I know). He had been teaching at the US Air Force listening post in Crete, one of various then scattered strategically around the Soviet Union. One was at Chicksands in Bedfordshire, another near Brindisi and another in Japan. When I taught on the Brindisi base, (closed in 1994) a student told me that they listened to Moscow radio taxis – I wasn’t sure if it was a polite way of telling me not to ask questions or if he was commenting on the results of the huge expense of maintaining the base. The aerials are huge affairs, a circle of steel girders looking like a gasometer designed by Botero, more than half a mile in diametre. The listening personnel were supposed to be native (or very competent) Russian speakers able to deal with oral en clair or decrypted communications. At the Brindisi base, all the support buildings were grouped together with only a few technical huts around the perimeter. Apart from Russian speakers, given the location, I presume that there were a few Albanian and Serbo-Croat speakers but I didn’t meet them. On Crete, not surprisingly, there were Arabic speakers and as for the location of facilities, in contrast, apparently, there was a second, smaller, but substantial group of buildings diametrically opposite the main site. This was, my colleague told me with more than a wry smile, for speakers of another semitic language used in the eastern Mediterranean but whose native speakers in the late ‘60s, early ‘70s probably would not have been happy being quartered with native speakers of Arabic. These were speakers of “special Arabic”… Hebrew. Since my friend told a good tale, I was always a little skeptical about the story; surely Mossad was not going to be fooled by “Special Arabic”. But then the German intelligence community presumably is not fooled by the “Special Collection Service” so I checked and found that the euphemism is indeed used and even that there were Hebrew speakers on the USS Liberty, the navy audio-surveillance ship attacked by the Israelis in 1967 during the Six Day War. That the Liberty was spying on the Israelis has not been proved but the Americans were certainly listening to Israeli traffic then and presumably now… and vice versa. Today’s scandal is different though. It is not a Spy vs. Spy game (although the Liberty incident was hardly just a game – 34 men died in the attack) between professionals. 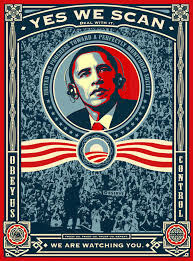 Today NSA is accused of listening to the leaders of two of the US’s closest allies; worse, President Obama is accused of knowing about the tap since 2010, a major breach of trust and another blot on the reputation of the Nobel Peace Prize winner (the latest spoof is the usual picture of Obama with “Yes, we scan” underneath and in some versions, next to it, “Stasi 2.0”. The security and economic interests of the US and EU remain the same and so relationships will be patched up even if worse revelation are to follow but international relations depend on trust between leaders as well as big interests and that is not going to return for some time. Here in Italy, everything is calm, at least until tomorrow. Prime Minister Letta has dismissed any possibility of inappropriate behaviour by the Americans in Italy but tomorrow the parliamentary committee in charge of secret service oversight, the Copasir, meets and will ask questions about the Rome Special Collection Office and we might get to know if Italan leaders’ phones have been tapped . One Copasir member has already said that US and Italian agencies have worked together listening to Italian leaders. If they have, there will be outrage not just from the usual anti-American elements on the left and right but across the spectrum – everyone apart from diehard contraries like Giuliano Ferrara editor of Il Foglio. If they have not, the hurt pride will almost be worse at the idea that Italian leaders are not worth listening to and are somehow not at the same level as Merkel or Hollande. At the European Council today, immigration policy is once again on the agenda. Italian prime minister Enrico Letta has put forward a number of plans for immediate implementation including cooperation between EU countries in patrolling the Mediterranean, EU offices in transit countries like Libya to deal with asylum requests for the whole of the Union (and presumably Norway and perhaps Switzerland) so that potential refugees would not have to risk their lives on the crossing and, from Italy’s point of view, would not have to be processed in Italy. Cecilia Malmstrom, the EU Internal Affairs Commissioner agrees that this is the Commission’s agenda too. Italy also wants European financial support for the burden of dealing with asylum-seekers. There is no doubt that asylum-seekers who arrive in the EU through Italy are the most dramatic and come with a terrible cost in human life but large numbers come from Russia and Serbia and most Afghans (the biggest single group in 2012) do not come in through Lampedusa. In absolute numbers, Italy does not have the most. And when it come to those who are granted asylum, it is Germany that takes the lion’s share at 23.2% with France (18.3%) and Sweden (13.1%) following and Italy taking 5.2% or around 17,000, the same as Austria with an eighth of Italy’s population. There is a confusion over the issues – humanitarian, economic and social. In the days after 3 October sinking which cost more than 360 lives, there was a host of polemical articles most of which missed the point in the horror of the tragedy. On the one side there was Magdi Cristiano Allam in the Berlusconi family's Il Giornale. Allam is a former immigrant himself and convert to Chistianity. The headline said it all Basta con le ipocrisie gli immigrati ormai sono un lusso (“Enough hypocrisy; immigrants are a luxury by now”), an article which was extraordinarily full of venom, out of place as the coffins were being lined up in Lampedusa and out of place given Allam’s own welcome in Italy (and his new Christian or old Muslim obligations of charity). On the other side was the invitation from a Milanese immigrant NGO to a demonstration in piazza del Duomo under the banner “BASTA MORTI NEL MEDITERRANEO! DIRITTO DI ASILO E ACCOGLIENZA PER TUTTE/I!” Enough deaths in the Mediterranean. Asylum and welcome for all”. In a Europe just coming out of recession and with a rising populist right, “asylum for all” would be a policy disaster. Another confusion was in the government initiative to increase Navy and Coast Guard patrols which sent a mixed message to Italians (“we are protecting you from the immigrant invasion… but at the same time, we will stop future disasters”) which convinced no one and an unequivocal message to the traffickers (“whatever rustbucket you use, help will be close at hand”) which they immediately acted on and sent a whole fleet of unseaworthy craft heading towards Lampedusa and Malta. The issues reminded me of a psychological test once used to gauge a patient’s values. The central figure is a woman who lives by a river; the other five characters are the husband, the lover who lives on the other side of the river, a friend, a boatman and a bandit who stalks the bridge and kills anyone who passes. The woman takes the ferry to see her lover but when it is time to go home, she realises that she has no money for the ferry. Neither lover nor friend will give her the money and the boatman does not take credit. She takes the bridge and is killed. What order do you put the responsibility for her death? To give the responsibility an order, each one of us has to create back-stories for the characters and make our own decisions about the relative importance of legal responsibility and human solidarity as well as the relative weight of the woman’s links to husband, lover and friend. An adult who entrusts his or her life (and that of an infant child) to a criminal trafficker and an unsafe boat knows the risks. The skipper of the boat is clearly directly responsible but while he was earning a few thousand euros for the trip and risking his own life, his bosses back in Tripoli had already taken hundreds of thousands of euros. Then the governments or non-governments in the Horn of Africa or Syria are responsible for making life so dangerous and impossible that anything is better. At the Italian and end, there is a responsibility in the 2002 Bossi-Fini law which regulates immigration and above all Roberto Maroni’s 2009 decree law which makes irregular immigration into Italy a crime; this discourages other boats from intervening. Further along the causal chain are the longterm European responsibilities in the instability which makes people seek asylum. The normally pro-European and liberal Barbara Spinelli compared Europe to Sophocles’ Creon ignoring Antigone’s appeal to universal rights. There are no easy answers to the questions but certainly some of the confusion has been grotesque. A few days after the disaster, prime minister Letta promised a state funeral for the victims; instead most were buried in Sicily with survivors confined to Lampedusa and not allowed to attend and Eritrean authorities invited even though they are part of the problem. Less serious in media terms but much worse for the longterm management of the issue is the almost complete absence of distinction made between asylum-seekers (which Italy has a legal obligation to process and then give status and protection to those granted refugee status) and economic migrants. President Napolitano tried to explain that the Lampedusa victims were all would-be refugees and most of them would certainly be given that status. But neither politicians nor media continued the distinction, reverting to a generic “migrant”. Whatever they are called, they will not go away and whenever there is a crisis combined with an availability of money, the traffickers will move in and find a way to shift those migrants towards Europe. Today’s Council meeting has not solved the problems but if it can move towards a solution before the next disaster, it will be a start. Labels: The Unaddressed Immigration Questions. One of the more bizarre interview requests I have received was this afternoon when Turkish Radio and Television (TRT) sent me an email. I presumed it was about the usual Italian questions; instead the topic was “to discuss San Marino and its refusal to be a member of the European Union”, not an item at the top of either my own news agenda or most others for that matter. Now we all know that Turkey has had a long and sometimes troubled relationship with the EU and previous incarnations for 50 years and so could be expected to show an interest in others would or would not like to be part of the club. But San Marino? Turkey has a population of 74 m., San Marino with 32,000 does not reach half of 0.1%. It is wholly surrounded not just by Italy but a single region of Italy, the Marches (most of the Sanmarinesi who live “abroad” are in the Marches or Emilia Romagna, a different country to be sure but the same accent and variety of Italian, the same food and same architecture). It has also had agreements with the EU since 1991 covering most economic matters. On Sunday, they were asked to vote on whether San Marino should apply for EU membership; a very small majority said yes 50.3% to 49.7 saying no but as only 20% of the electorate voted and the threshold is 32%, the results were declared invalid. The ruling Party of Socialists and Democrats (PSD) was pro-accession, the Christian Democrats were neutral and the right was against so the result was a blow for the PSD. But it was hardly a blow for the EU. Clearly the majority of Sanmarinesi had better things to do than go and vote; accession would not change the lives of anyone except perhaps the few who aspired to a Brussels job. The everyday questions would hardly change for most of them. The centre and the right were neutral or against the application. Some had worries that membership would prevent San Marino from controlling immigration. Until 2008, San Marino was a tax haven, mostly for local Italian businesses but then the Italian authorities started looking for Italian tax evaders and the EU authorities started applying international banking regulations much as they have done with the Vatican. The EU too is not keen to consider microstates like San Marino, Andorra or Monaco so an application was unlikely to be successful which discouraged many voters. Supporters of the application hoped that membership would modernise the country but they will have to wait for another opportunity. More interesting than the San Marino vote is why an international Turkish broadcaster dedicated more than five minutes of a 45 minute show to the issue. The questions emphasised that San Marino had “rejected” the EU and whether this meant that the “European dream is over”. I could only answer that the Sanmarinesi were not “dreaming” about anything. They took a very pragmatic decision based on their interests. In a Europe riddled with different crises, few have dreams but most know that an EU is better than no EU. Even England, if it ever comes to that, will realise that the advantages of “Europe” in all its forms outweigh the disadvantages. The Serbs who aspire to membership, are inspired and moved by Russia and the greater Slav culture but they have no desire to become part of a greater Russia; they have no emotional attachment to Brussels but they very much want to be part of the EU. The European “dream” which the founders certainly had, was intentionally masked by two resources which could not have been more concrete: coal and steel, essential to rebuild a ruined continent. Since then, “Europe” has always been short on inspirational rhetoric and long on tedious regulation. Turkey wanted to dream in the Sixties when they first applied while the Europeans stalled. Today, it is Turkey which is full of doubts but they have little to console themselves with from San Marino. Labels: San Marino and Turkey.